I decided on a new tag, NIAB (Not In A Box) for any of my posts of meals I create but not in a bento. These are usually dinners or special occasions and allow me to put in an in between post when I don't have a bento to show off. So as I said I didn't have a bento this week instead I chose to focus on making a nice dinner for my girlfriend. I got some photos in so I figured I can share it with you. For dinner I did a quick and light menu. 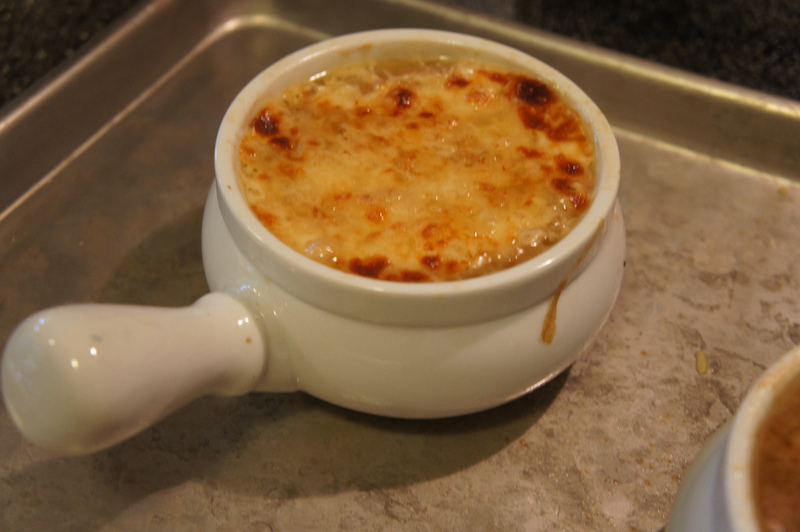 I started (Ok I say I started but i didn't want to be hussling so I really served everything up all at once) with a classic French Onion soup (a requested favorite), I think I could have eased up on the cheese as it was a bit much, still it was gooey and yummy. The long slow cooking time on the onions really paid off because the soup was delicious. There was some disagreement on how far you cook the onions, some say that you cook them down to caramelized, others say to stop short of brown. I went with "just starting to brown" opting for a little sweetness from caramelizing. All told, without the cheese this could be considered a pretty low calorie dish. 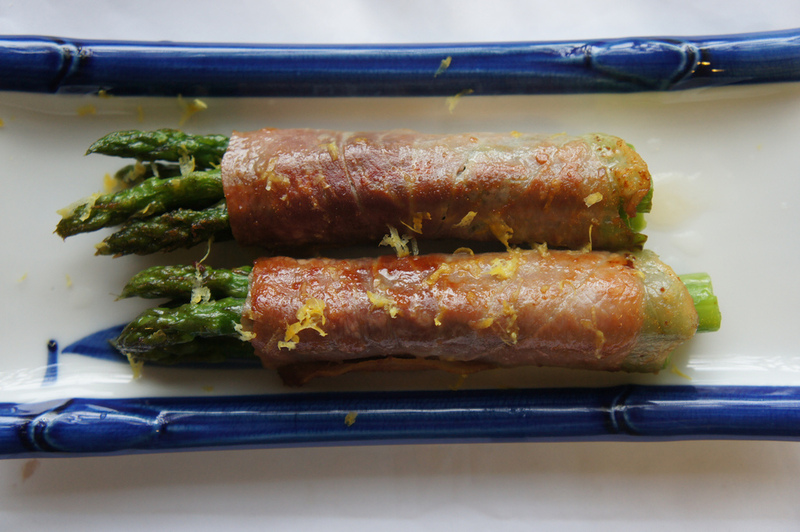 Next up is a simple asparagus wrapped in proscuitto, I topped it off with a bit of left over lemon zest and juice. This is always a simple dish easy to make dish that has a really nice presentation. 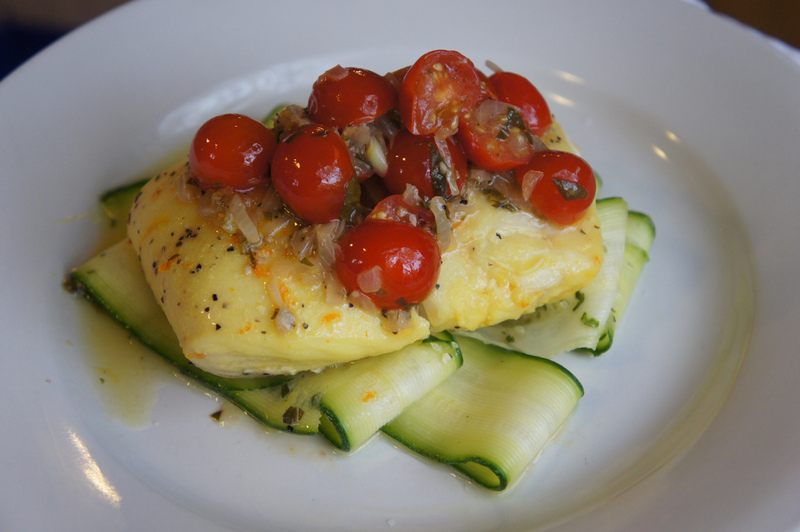 For the main entree, I went a recipe from the guys at SousVide Supreme (makers of my beloved "water oven"), Saffron-scented Halibut with Tomato Basil Compote and Zucchini. I'm not sure how this is defined as a compote, I believe a compote is a fruit that's been stewed in syrup. While techically a tomato is a fruit and I guess you can called this stewed (in it's own juices), this recipe is certainly contains no syrup. I'll have to follow up on this since more and more lately you hear terms like gastique, compote etc and a lot of them don't conform to definitions of those terms as I understand them. Perhaps it's time to update my culinary dictionary. I digress, this is the first time I've applied sous vide cooking technique with fish. 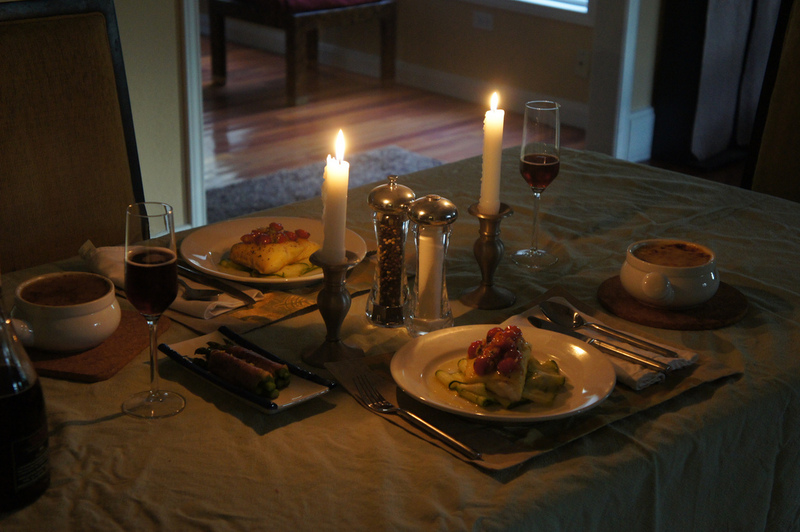 The halibut came out extremely tender and delicate aroma of saffron and citrus zest was really pleasant. Both the compote and the zucchini had very bright and surprisingly strong flavors while maintaining a nice cooked but not limp texture. This is a result of not losing any cooking liquids to a pan and the heat being controlled so as not to over cook any of the vegetables. The recipe calls for mint and I saw some fresh mint in the photo but it was not used in the cooking step so I skipped it since there were lots of aromas and flavors dancing around once less probably was a good thing. 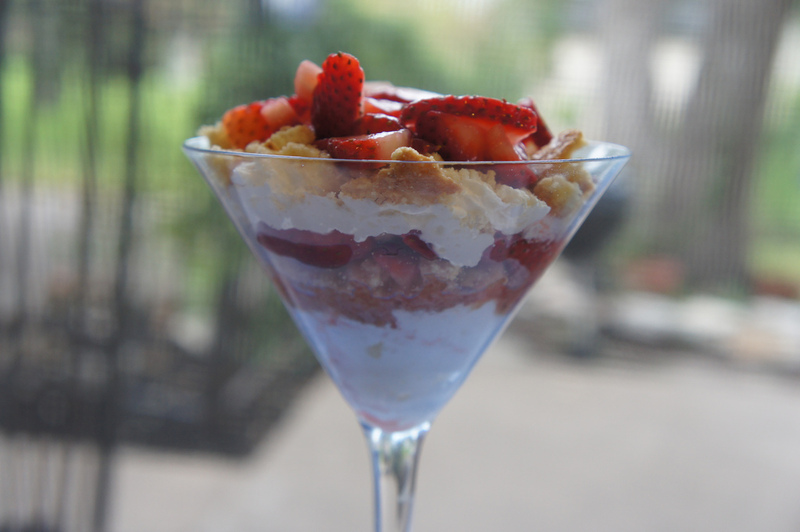 Finally dessert was a simple quasi trifle. I started by macerating some strawberries and taking a rolling pin to some plain biscotti. I figured the biscotti would act as the "sponge" component and provide an interesting texture. Since whipped cream is light and fluffy a little went a long way so the dessert wasn't nearly as "bad" for you as it might look. Yes there's a lot of useless sugar but most of it was air. Dinner was well received and was well deserved since my girlfriend was in a workshop all weekend. Ok well, bento next week see you then!